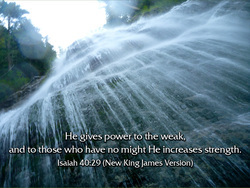 He invigorates the exhausted; he gives strength to the powerless. He gives strength to those who grow tired and increases the strength of those who are weak. He gives strength to the weary and strengthens the powerless. He energizes those who get tired, gives fresh strength to dropouts. He gives strength to those who are tired and more power to those who are weak. He gives strength to those who are tired. 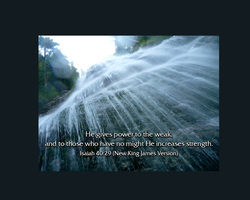 He gives power to those who are weak. He gives strength to the weak. And He gives power to him who has little strength.